When you're travelling early in the morning and after your busy day at work or university, it can be easy to let your commute become an unproductive part of your day. 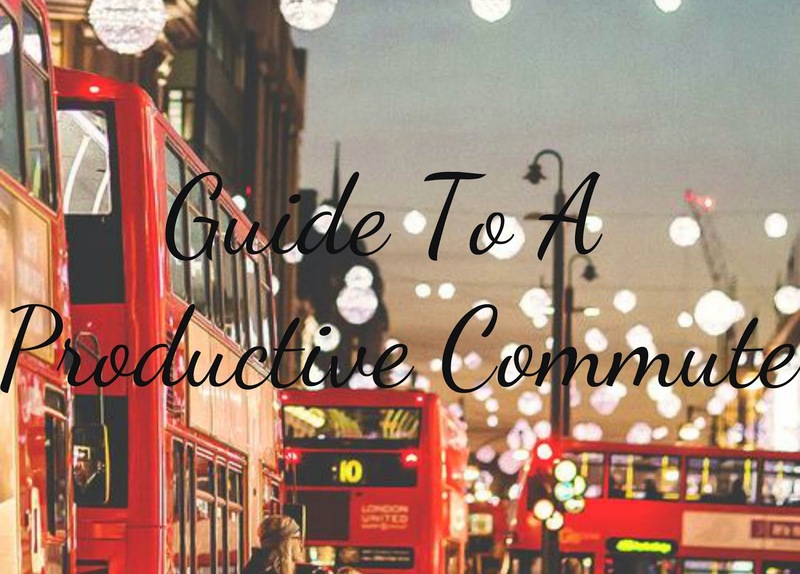 But after commuting for a whole first year of uni, I've found that making the most out your commute can be beneficial for combating work or university tasks and also balancing those commitments with other hobbies such as blogging. Even if you're on top of the majority of your to do list, it's a lovely feeling to be able to arrive home and relax straight away, which is why your commute is the perfect time to get productive. Your to do list should always be an accessory for your commute. Having a physical copy of your to do list with you during your commute allows you to see on paper (literally) how much you need to do and therefore allow you to manage your time better during your journey. I always find seeing your tasks staring you in the face in the form of a list gives me a lot more motivation to get through them; there's a feeling of satisfaction that comes with striking through them one by one. During my journeys I am at my most productive when my iPhone is in my bag and I'm using a notepad to do my work in. An attempt to do an actual piece of work via my iPhone always leads to procrastination. Preparing interview questions somehow turns into Instagram, thought-mapping becomes tweeting...one minute I'm writing a news story, the next I'm sharing an adorable video of a puppy on Facebook! The best thing to do to avoid distraction is to stick to the notepad and limit your phone use; I only use mind for any research and listening to music. Nothing will put you off getting some work done during a commute more than being tired. You'll sit down on that train seat and just want to slump. Well, don't! The way I look at it is that if you make good use of that time, you'll be able to get into bed earlier as you'll have less to do once you get home. Getting enough sleep will not only help with your productivity during your commute and throughout your day but will also benefit your body in a huge in a number of ways. So, banish your dark circles because keeping up with your sleep means keeping on top of your work. There will be days when your train is near empty (heaven) and days where it's packed and on top of that a heavy breathing, talkative stranger chooses to sit next to you (hell). I don't want to get onto a busy train and be forced to forget about the mountain of work I have to get through as I "can't concentrate". Even though distractions can be an obstacle, at the end of the day, no one is going to stop you completing your tasks other than yourself. It sounds harsh but there have been a number of times that I've had to say to myself, "Yes, it's noisy, too hot and I want to elbow the seat hogger next to me in the chin but I just need to get over it". You really just have to accept your surroundings, compose yourself and get on with it. Making your commute productive can be a difficult task, but with the right amount of dedication and perseverance it can become very rewarding. Speaking from experience, the days that I've firmed distractions, tiredness and let's be honest sheer laziness have been my most productive and taking advantage of my travelling time has definitely allow me to balance my university work, blogging and free time with more ease. This is sooooo true - my phone is the most distracting thing ever!! i was doing a really long commute earlier this year, and found i was flying through books - like 2 a week!! it was such a good use of time! i can't stand seeing people sitting there staring up to the sky the whole journey - what a waste of time!! I'm like dude, you're not gonna get these hours back!! I commuted from London to Guildford for my Masters a couple of years ago which was full-time drama school. I was up at 6am, and on the 7.30am train everyday, home by 8pm if I was lucky. I spent most of my commute with the best intentions but would end up sleeping, or if I didn't have a seat, learning lines or songs for my course. Hardest year I've ever done! Good advice you've got there, especially about using actual note pads instead of a phone, makes things more set in stone I think! Hey, How long is your commute? I'm hoping to go to uni next year but I don't want to go in halls and commuting is the only other viable option! Great post! I'm gonna try not using my phone next time while commuting. As you said, working in a notebook is the best option, but sometimes if I haven't planned out my to-do list perfectly, even writing down notes feels like I'm not being as productive as I should be. Any advice?